This recipe is a super simple side dish/ dip/ grab a spoon and eat the whole lot in one go! A traditional Mexican accompaniment to dishes like nacho’s and burritos but i absolutely love it on toast, topped with perfectly runny poached eggs for a delicious, nutritious and colourful breakfast! 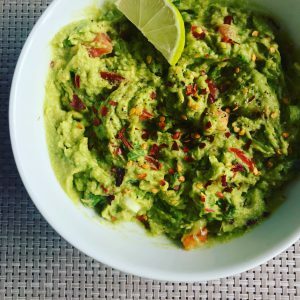 I never like to let food go to waste, especially something as special as avocado, so if I’ve got some slightly overripe avocado’s on the go then you can bet i’ll be whipping this up! It’s great to make and pop in air tight containers in the fridge, it’ll keep for up to three days so you can grab it when you have your next snack attack (it’s great with crunchy veggie sticks dipped in!) or to add to a salad for your workday lunchbox! My top tip is to keep the seed out the middle and place it in the container or serving bowl until you’re ready to serve, this helps to stop the Guacamole from turning brown and discoloured! The lime juice helps to prevent any discoloration too so don’t worry if you’ve already binned the seed! I love this recipe as it’s only a few simple ingredients that i usually always have knocking about and it creates such a tasty dish that you’ll want to make again and again! Peel the Avocado, carefully removing the seed from the center (remember to reserve it for later!) and chop into large chunks. Add the chopped Spring Onion, Diced Tomato, Chili Flakes and Lime to the Avocado mixture and mix well to combine. Season with the Salt and Pepper, taste and adjust the seasoning of the Guacamole and add more Lime juice if necessary. To serve I like to sprinkle a few dried Chili flakes on top, to can also add a little fresh Coriander too if you like! Dig in and enjoy! !